I am back in Taipei on a short business trip. As always, meals are precious commodities that need to be juggled, since I have to have dinner with business partners and sometimes friends as well. This time though, I made the effort to have some alone time, and visit Hoshi. I promptly made a reservation two months ago and I was told that their minimum for a reservation was 2 persons. Being a solo diner on this particular occasion, I asked (actually pleaded) for reconsideration and was finally granted a seat two weeks before my trip. 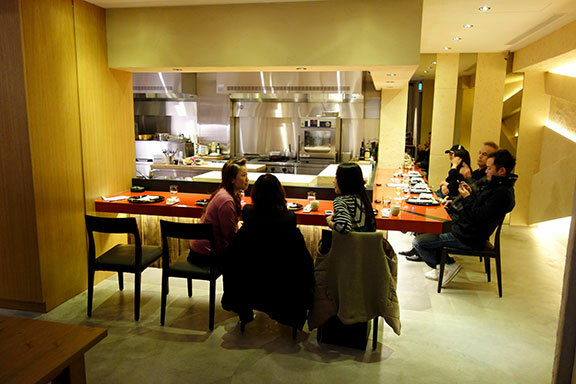 A few things to remember when eating at Hoshi: it is only open for dinner and there is only one seating that starts promptly at seven. Make sure that you come on time lest you get a nasty stare down from seven other hungry diners as you walk in. Also, there is no set menu and courses are conceptualized based on what is freshly available that day. I was amazed by the beautifully simple interiors of Hoshi. Never have I seen a restaurant that uses quite a large space to service just eight diners a night. 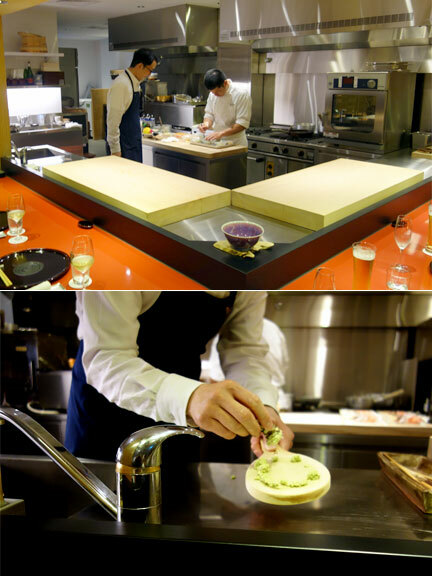 I like the fact that there is a large, clean and modern kitchen and it is only used by one person, Chef Hoshi Satoshi who counts his experience cooking in Canada and Nobu in Tokyo before starting his own restaurant. Aside from Chef Hoshi, he has two other staff members to keep him company. A full-fledged sommelier and Amy, who is server, interpreter and restaurant manager all in one. Once dinner service began, we were all served a tiny portion of Umeshu (plum wine) to toast to the night’s success. After I ordered a nice bottle of unfiltered Sake to go with my meal, out came the first course. Diced Fresh Vegetable Salad, Soya Sauce Gelee, topped with Fresh Hokkaido Uni and Fresh Grated Wasabi. Refreshing, tasty and a quite a good start for the evening. 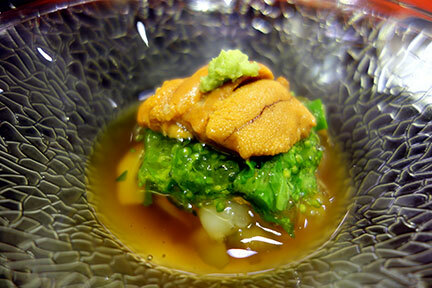 The uni was extremely fresh and its high quality was evident. My thoughts were that if this preamble sets the tone for the whole meal, I would be going home with a smile on my face. 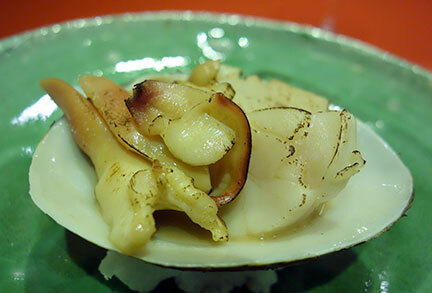 For course number two, we had Fresh Hokkaido Scallops poached in a delicate Echiré Butter and Mirin Sauce. Delicate was the adjective that run through me as I savored each and every bite. The combination of the subtle Echiré butter and mirin, enhanced rather than overpowered the flavors of the scallop making this dish a joy to have. 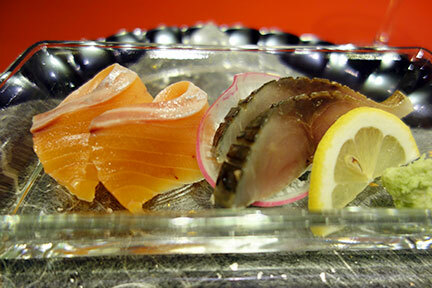 A Sashimi course followed, with slices of Fresh Wild Salmon, and Saba or Mackerel. Fresh water and salt-water fish served side by side gives one a yin yang impression. Both fish are similar as they have an oily consistency, although one should have the salmon first since it is mild in comparison to the stronger tasting saba. Not to forget, this dish was served with fresh grated wasabi and the finest artisanal Japanese soya sauce. 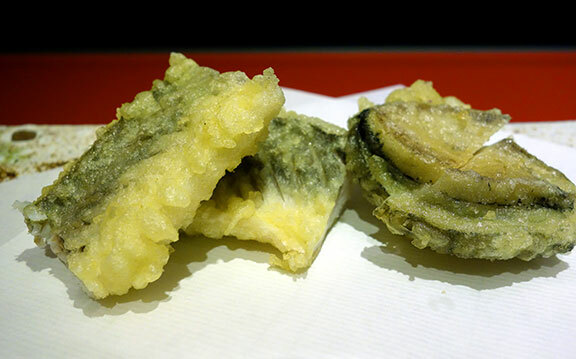 Tempura followed and we were served a five-hour braised Australian Abalone Tempura and Barracuda Tempura, served only with Hokkaido Sea Salt. Much preparation was involved in this seemingly simple set. Aside from the braising of the abalone, the bones of the barracuda were each painstakingly removed by Chef Hoshi by hand. I must say that I liked dipping the tempura in sea salt instead of the usual sauce, just because the actual flavors of the seafood involved were not masked but in fact, enhanced. 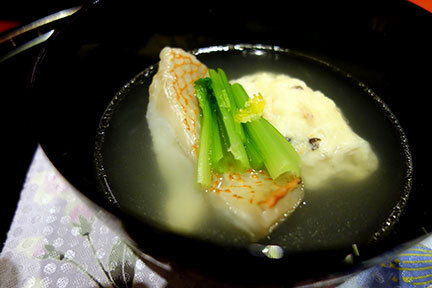 Our sixth course consisted of Snapper Steamed in a Sake Broth With a Yuzu Ponzu Sauce. Fresh simplicity, acid and tartness = awesome is how I would describe this dish in a nutshell. Beef was next and we had a couple of slices of high quality Wagyu Beef coated with a Lime Miso Glaze and a Grilled eggplant. 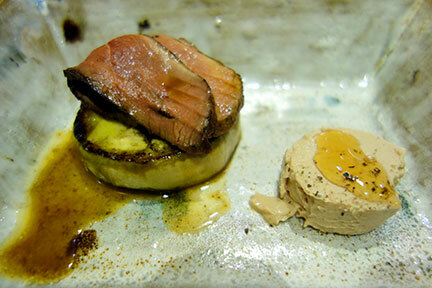 The beef was paired with Pate de Foie Gras that had Honey and Fresh Cracked Pepper. Amy whispered to me that this was her favorite. For me, honestly, it was good but I wasn’t blown away. I understand that Chef Hoshi tried to serve a lean portion of beef to counter the Foie, but I found the beef a tad overcooked and the foie too sweet for my liking. 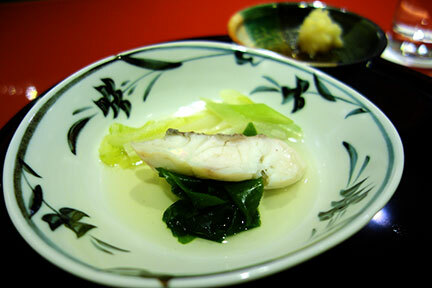 Normally, the last savory course during a Kaiseki meal consists of steamed rice with some pickles. This acts like a filler for those who are still hungry at the end of the meal. Chef Hoshi I guess does not subscribe to serving anything so mundane. 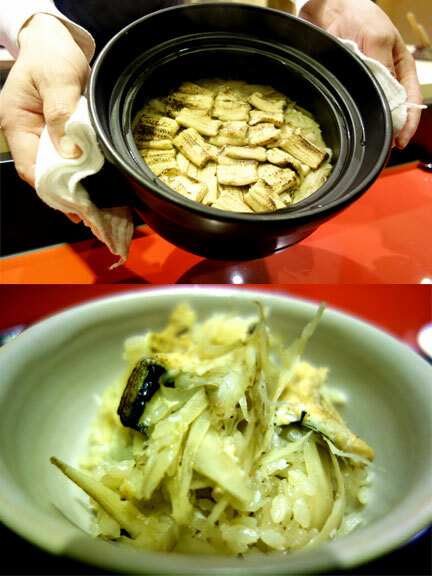 Instead, he offered us Fresh Anago (Sea Eel), Onions and a hint of Dashi Steamed in a Pot of Japanese Rice. I absolutely loved this. Everything worked so well together and I could not stop eating even if I was quite full. I actually had to channel my inner Dickens and asked for more. Apparently, my tablemates also had the same idea as everyone had seconds and some growing boys even went for their third bowl. After having a very delicate palate cleanser, a traditional Miso Soup that had fresh Maitaki and Nameko Mushrooms, we proceeded to dessert. 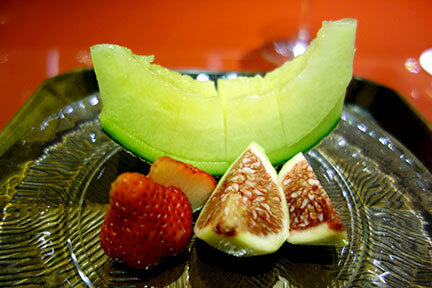 A simple fruit plate that had a slice of exquisite Taiwanese rock melon, some strawberries and fresh figs from Japan. Chef Hoshi made sure that all fruits were at the perfect ripeness level, ensuring everyone’s maximum enjoyment. I highly recommend having dinner at Hoshi when you visit Taiwan. 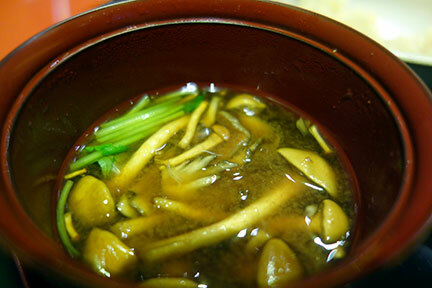 I have always heard that Taiwan has the best Japanese food outside Japan. Even if this statement was not true, food quality, service, interiors and even place settings are all top notch. The restaurant has only been open since October 2013, and as word gets out, I would believe that it would be more difficult to obtain a reservation. So book as early as you can and I assure you that there will not be any regrets; rather, a great Japanese dining experience awaits.